Every once in a while you see a protest or campaign action for a cause that you ostensibly support, but it just makes you want to put your head in your hands at how unhelpful it is. This is one of them. For a start, that’s Cameron’s home, not a seat of power. Let’s not drive tanks to people’s family homes. Secondly, supporting fracking is not the same as using chemical weapons on your own people. Not by a million miles. If you saw the horrible stories out of Iraq last week, where Isis have begun using mustard gas, then the comparison looks not just stupid, but offensively so. Even if the comparison were valid and Cameron was actually attacking his own people, then the message is still all wrong. Driving up in a tank is an act of symbolic violence, and uses the same language as the supposed aggressor. Judging from the photos, someone’s allowed a load of children out of school for the day to join in. Is that something we really want children to do – act out a pretend chemical attack on David Cameron’s house? I’m sure the protestors had fun, and it’s clearly meant to be a joke. Unfortunately this kind of stunt can be deeply counter-productive. The central conceit here is so hysterical that it won’t change anyone’s mind, and it makes it easier for people to dismiss anti-fracking arguments. When Cameron talks about this with his colleagues, nobody will be agreeing with them and suggesting a moratorium on fracking. The conclusion will be”we don’t need to worry about these nutcases”. By way of contrast, my favourite anti-fracking campaign is Repower Balcombe. That’s the first village in Britain to experience fracking, and the site of protests and blockades a couple of years ago. Since then, the community has set up a solar cooperative that will produce enough electricity to power the village. It’s a positive and inspiring reaction, and the crowdfunding approach welcomes others beyond Balcombe to be part of it. It demonstrates a solution rather than standing in the way. And it’s empowering: the community does something for themselves, rather than demanding change from the authorities. Repower Balcombe is a campaign that tells a different story about the future – a prophetic action, to use a spiritual term. I like protests that ‘overcome evil with good’, but that doesn’t mean it has to be subtle or non-confrontational. Sometimes it’s right to make a nuisance of yourself too, and there’s a much more thought-through example of that taking place in London at the moment. 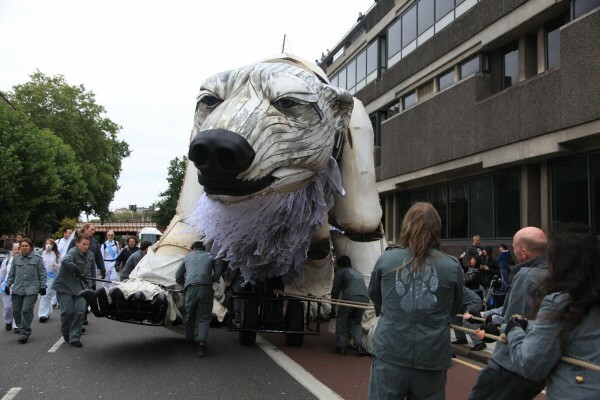 Greenpeace have parked a polar bear puppet as big as a double decker bus outside Shell’s corporate headquarters in protest at Arctic drilling. Unlike Westwood’s tank parade, there’s a wider campaign behind it that people can support, giving it momentum. The bear itself is a work of art, a creation with soul, and with value beyond the shock factor. The Greenpeace action is far more likely to be a thorn in Shell’s side, and the police for that matter, since they intend on staying. The bear on Shell’s doorstep is there to shame them, to roar at them, to bear witness in the full sense of the expression. But it doesn’t threaten or get personal. At least, not if the protestors are behaving themselves. Passions run high in protest circles, and people want to do something. But how we protest matters. It pays to be smart about it. Cannot agree more with your comments concerning the utterly absurb/ludicrous behaviour by Vivienne Westwood’s event of driving a Tank to the Prime Minister’s house. This person supposedly represents the higher echelons of the Fashion Industry, such behaviour will not do that image much good; seems if she wants to make a point about her views on Fracking, she might be better speaking directly to the those that are struggling to find a way to maintain the infrastructure of power for now and the future of an ever exploding population. Such personal vanity often shown by such people in the public eye, endeavouring to ensure that they are not forgotten-not difficult when they behave in this way.